Environment Canada says wet snow in areas north and west of Toronto on Thursday morning is a sharp reminder that winter is coming. Wet snow that fell in and around the Greater Toronto Area on Thursday morning is a sharp reminder that winter is coming, a meteorologist with Environment Canada says. The snow largely missed the city of Toronto. 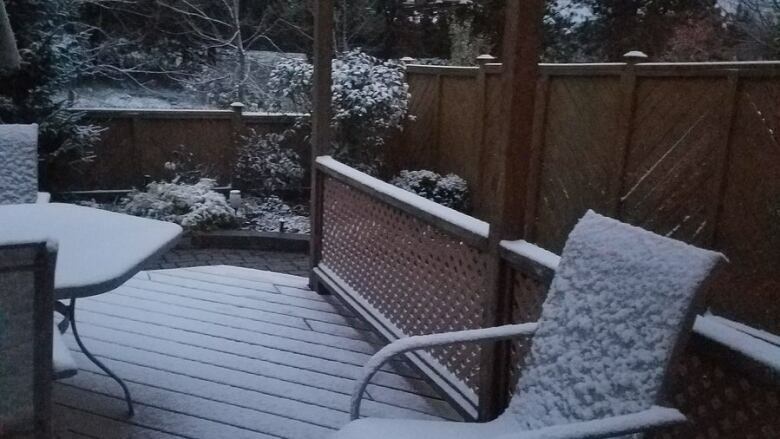 Environment Canada called it the "first appreciable snow of the season." Geoff Coulson, a warning preparedness meteorologist with Environment Canada in Toronto, said the snow is most likely a one-day event but it has served a purpose. "It's a bit of a reminder for folks," Coulson said. "More in the way of snow is coming in the coming weeks. But this particular event, and the snow with it, will not likely last more than a day or two." A few residents north of the city posted photos on Twitter of decks, cars and roads coated with snow. Coulson said a special weather statement is in effect for parts of southern Ontario. It includes areas south of Georgian Bay to Caledon, east to Lake Simcoe, Barrie and Orillia and further east into Peterborough and into the Ottawa Valley. "It's those areas that will get the highest accumulations of snow," he said. "By late October, we do see the first colder air masses coming down from Northern Ontario. Situations like this are not all that uncommon." Coulson said people driving in and around the GTA on Thursday should be aware that some temperatures are at the freezing mark and parts of roads could be icy. Areas near the Haliburton Highlands could see five to 10 centimetres of snow by late Thursday. Double digit temperatures are in the forecast for the Greater Toronto Area by Friday. Daytime highs more than 15 degrees C are expected on Saturday.